Send the sweetest birthday wishes with four creamy ice cream flavors. 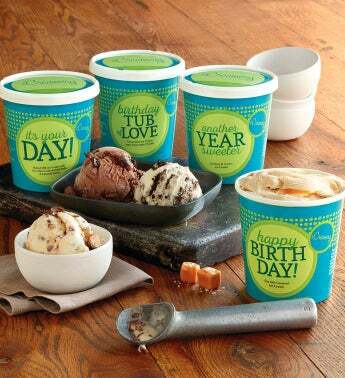 The ice cream, crafted in small batches by a boutique ice cream parlor in Omaha, features such delights as "Birthday Tub of Love" chocolate ice cream with chocolate chunks, and delectable "Another Year Sweeter" cookies and cream. An ice cream delivery is always memorable and definitely appreciated.